Krispy Kremes are the creme de la creme in my book. Maybe because its so hard to find in New York. So whenever we go on vacation we seek out a Krispy Kreme in that city. We've been to a Krispy Kreme in every state we've visited. San Diego, Orlando, Atlanta, LA, Maryland, Scottsdale...the list goes on. I know my cousins think we're nuts because whenever we visit them, looking for the Krispy Kreme HOT sign and buying a dozen donuts to devour is always on our food itinerary. I mean seriously, HOT donuts!? How can you pass that up? Super soft, puffy with a crisp sweet glaze. So with that being our favorite, I am out to find a donut recipe that I can make at home that can rival it. As for the topping, it has to be a glaze. But I need to add a flavor and I'm always obsessed with citrus. Key lime pie is a second obsession of mine. I think I have a lot of food obsessions, but this is something I always need to get if I see it on a menu. For our first baby moon, my husband took me to key west. I was 7 months pregnant, feeling like a whale, and he took my to Key West, FL in the middle of August. Yes...it was so humid I could barely breathe and had to take multiple ice cream breaks to catch my breath as we walked through town. But one good thing that came out of the trip was discovering the best key lime pie I've ever had. Kermitt's Key Lime Pie. Hands down. I basically ate a whole pie as my birthday cake during that trip, and stopped in almost daily for my key lime fix. So... something sweet and sour atop a soft chewy fresh donut... YES PLEASE! This glaze is created with condensed milk, key lime zest and juice. It's seriously just like the pie. I was lucky enough to find key limes at my supermarket. But regular limes would work just as well. I just started to venture into the donut frying territory. I was always terrified of deep frying because of all the oil temperature monitoring, and what do you do with all that oil once you're done!? But I figured it all out and it's fine and not as scary as it sounds! Plus it produces a donut you just can't make by baking it. It's totally worth it in my book. I mean I made these and between me, my sister and my brother in law, we ate the whole batch in one night. Not a particularly proud night for our summer diets, but they were so good going down! So this recipe I found from Baker Beatte. It was a simple dough that didn't need a whole lot of work or rest time, so yes. I'm in. Start with yeast and milk. Mix with the butter (yum! ), sugar, salt, an egg and flour. This creates an enriched dough which are generally softer and fluffier. The dough is soft and slightly tacky. Let this rise for about 1 1/2. Then chill in the fridge for 30 minutes. You can go overnight, but I wanted these donuts as soon as possible! Once its been chilled, roll out to about 1/2 inch and cut with a donut cutter and let this rest for another 45 minutes. I was so excited about these donuts that I forgot to take a picture of the cut donuts, but imagine beautiful puffy donut shaped dough in gorgeous, soft natural light. Yup. That's exactly how they looked! Time to fry! Heat about 5 cups of oil on high heat to 350F. Once it hits 350F bring the heat down to medium and you're ready to drop in some dough! Gently place the donuts into the oil and fry till golden brown on each side. It only takes a couple of minutes. Place on a paper towel to drain and once they are cool enough to handle, dip into the glorious key lime glaze. We actually double dipped these babies, because...we could. But glaze to your liking. And top one size with the crushed graham cracker crumbs. Please enjoy these warm. But cold donuts are just as good! Whisk the condensed milk, lime juice and zest till combined. Stir in confectioners sugar till smooth. Stir in water and mix for a glaze like consistency. It should be thick enough to coat, but thin enough to be slightly runny. Set aside. Warm the milk in the microwave for about 30 seconds. The milk should be warm to the touch. Sprinkle the yeast over the warm milk, stir, and let it sit until it begins to get foamy. About 5 minutes. In the bowl of a stand mixer, mix together the butter, sugar, salt, and egg. Fit the mixing bowl onto the mixer with the dough hook. Pour in the milk/yeast mixture and the flour. Increase speed to medium and let the dough knead for about 5 minutes until it forms a soft sticky dough. If the mixture seems too wet after kneading, add more flour 1 TBSP at a time until a soft but sticky dough forms. Loosely cover the bowl with plastic wrap and let rise till it has doubled in size. About 1 1/2 hours. 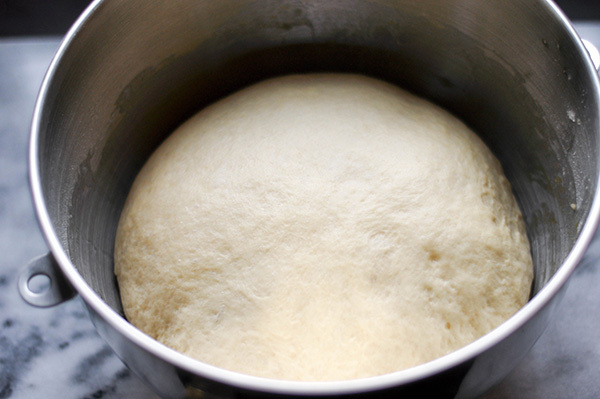 Once risen, chill the dough in the refrigerator for at least 30 minutes and up to overnight. Place the chilled dough on a lightly floured surface and roll out the dough to 1/2" thickness. Using a 2.5" donut cutter cut out donut shapes. Place the donuts on a baking sheet lined with parchment paper to rise. Cover loosely with plastic wrap and let rise for about 45 minutes. Donut Holes will only take about 20 minutes to rise. Heat about 5 cups of oil in dutch oven on high to about 350ºF. Once you read 35oF turn the heat down to medium and gently place the donuts into the oil and fry until lightly browned, flip and cook for another 1 1/2- 2 minutes. Remove from the oil onto paper towel lined plates. Allow to cool slightly before dropping them into the glaze. While the glaze is still wet, sprinkle half of the donut with graham cracker crumbs and enjoy warm...or cool...anyway you want to devour these!